Conditions can vary wildly during the football season, even during the course of a single game. Practice starts with two-a-days late in the summer, which, especially in the hotter regions of the United States, can be grueling under sweltering heat. Flash forward to the big Thanksgiving game and it could be snowing. During a game, conditions can be clear at kickoff and rainy and muddy by the end of the fourth quarter. Football rarely stops for bad weather conditions. 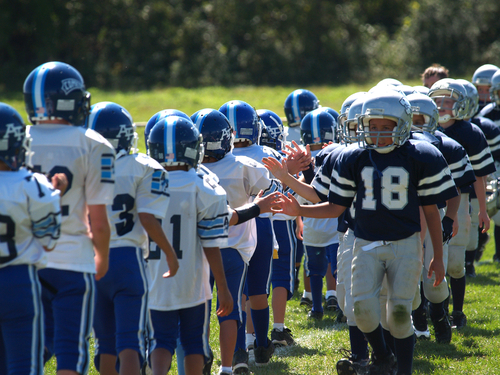 Because of this, and because of the huge swing in temperature from the beginning to the end of the season, football is among the most challenging sports for which to choose uniforms and training apparel. It’s often the moisture management athletic apparel worn beneath the football team uniforms that makes the difference. Managing moisture correctly is more than half the battle when it comes to keeping your football players comfortable and performing their best during practices and games. Hi-tech moisture management fabrics transport moisture (sweat) that evaporates off a football player’s skin to the outside air. If the moisture has nowhere to go, it doesn’t evaporate. This is a problem because it is the heat exchanged during evaporation that cools our bodies. Your football players that also study advanced physics can explain to you the technical details of why this is, but what matters is that moisture on the skin, trapped under a layer of non-breathable athletic apparel or uniform material means hot and uncomfortable players. Besides the danger of heatstroke and dehydration, hot and uncomfortable players do not perform their best. They become sluggish and less responsive, and more prone to mental errors. In colder temperatures, moisture management is an important aspect of football team uniforms and training gear, as well. When athletes stop moving, their bodies cool down. If there is moisture trapped inside their clothing, it can cause them to become very cold and uncomfortable very quickly. For maximum performance, gear should keep athletes comfortable through a wide range of temperature conditions. Fortunately, modern advances in fabric technology and apparel design make this possible. Technical football team gear combines fabrics with different moisture management attributes to arrive at the best solution for managing heat and moisture for any time of the season. If you’re not sure which type of fabric to look for, your team dealer can help. Team dealers are experts on football team uniforms and apparel and have access to a deep inventory of technical fabrics. They should be able to help you choose the right ones based on your team’s training schedule, your performance goals, and your budget. Our free guide for team sports coaches, athletic directors, and league officials also has some great information on how hi-tech team sports apparel can improve players’ performance. Download it by clicking on the image below.